By now, we all know how important it is to make sure our computers and phones are protected by antivirus software. These days, though, many of the most dangerous threats to our devices aren’t viruses; they’re exploits – think the Heartbleed OpenSSL scare and coding holes in software like Adobe Flash Player. Anti-virus software options fall short against these so-called zero-day exploits. 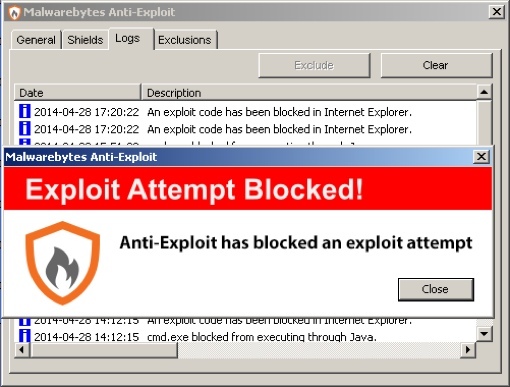 But a new offering from security company Malwarebytes called Anti-Exploit promises protection against the exploit itself for your Windows PC, shutting down the threat before malware can be delivered to your device. “Not a single zero-day has gotten through since the first beta, which let three vulnerabilities through,” Malwarebytes Director of Special Projects Pedro Bustamante told Cnet. The software works by looking for exploit-like behavior, helping to prevent attacks by way of previously undiscovered security holes in software. The software isn’t meant to replace your anti-virus program, but to supplement it. The best part about the Malwarebytes Anti-Exploit software is the fact that it’s free – or, at least, the lite version is. It protects against threats found in your web browsers, add-ons and in Java. A $24.95 premium version is also available that will expand protection to exploits found in PDF readers, the Microsoft Office suite and media players. You can learn more about Anti-Malware or download the software for your Windows PCs at malwarebytes.org/antiexploit. For more on keeping your all your devices protected, check out our computer security software buying guide.